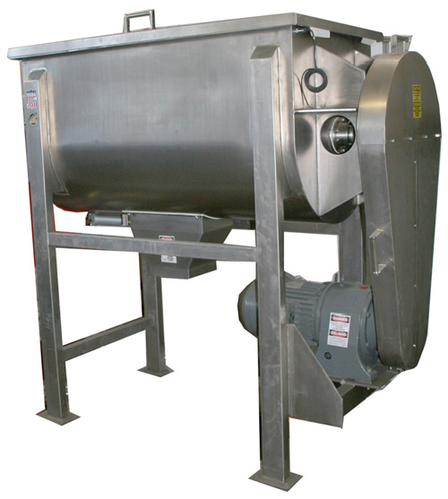 Ribbon mixer is designed for dry materials mixing, meantime liquid streams can be added. This mixer is composed of U-shaped cylinder, double helical ribbon blade and transmission parts. In working condition, the outer ribbon pushes materials from two sides to the middle, while the inner ribbon pushes materials from the middle to both sides. Through continuous convective circulation, the materials are sheared and mixed thoroughly and quickly. Batch cycle time shorten due to high mixing efficiency. Dry Powder, Putty, Modified Corn Starch, Real Stone Paint, Chemical, Food, Animal feed, Pharmaceutical, Fertilizer, Plastic, Battery, Cosmetic.